Dark burgundy, almost black, flowers with lacy white edges. Highly fragrant, highly attractive! 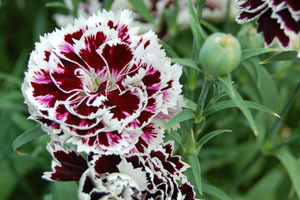 Very dark burgundy bloom with lacy white edges to dress it up. Flowers held on strong stems. lance shaped, blue-gray foliage. An elegant addition to a sun garden. Attracts butterflies. Great cut flower, bring the wonderful scent indoors. Can be used as a ground cover, along paths or in rock gardens.